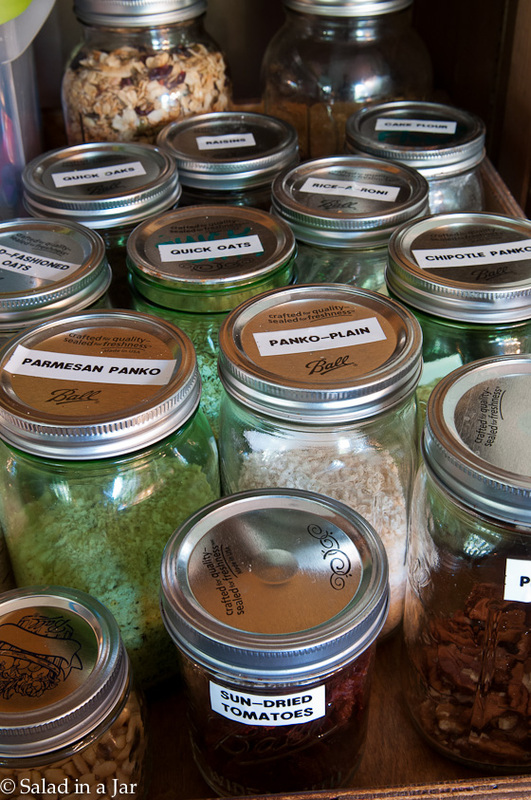 Curious about vacuum-packing lettuce in a Mason jar to see if it will help you eat healthier? Today, I’m giving an update on Vacuum-Packing-Lettuce: 5 Years Later. Have you ever wondered if the salad-in-a-jar lady still vacuum-packs her lettuce? Does she really eat it every day? What possessed her to start a blog about the whole idea of vacuum-packing lettuce anyway? When my oldest son was a computer science student in college, he reserved the domain www.paularhodes.com for no charge. If he told me at the time, I didn’t get it. Five years ago, he mentioned it to me again and by that time, I had figured out what a blog was. I knew I had something to share with the world–or at least a few friends. With my son’s technical help, we set up this blog in one afternoon. Unlike some people who agonize, sweat, and put lots of thought into their blog title, we came up with the name “Salad in a Jar” in less than 30 minutes. I already knew the process for vacuum-packing lettuce into a Mason jar (something I had been doing for 3 years already) would be my first post, so it seemed like a good place to start. Fast forward 5 years later (and 747,000+ pins of that first post) . . . .Yes, I still vacuum-pack 5-6 quart jars of lettuce every week. The lettuce-filled jars are my go-to weekday lunch with rare exception. 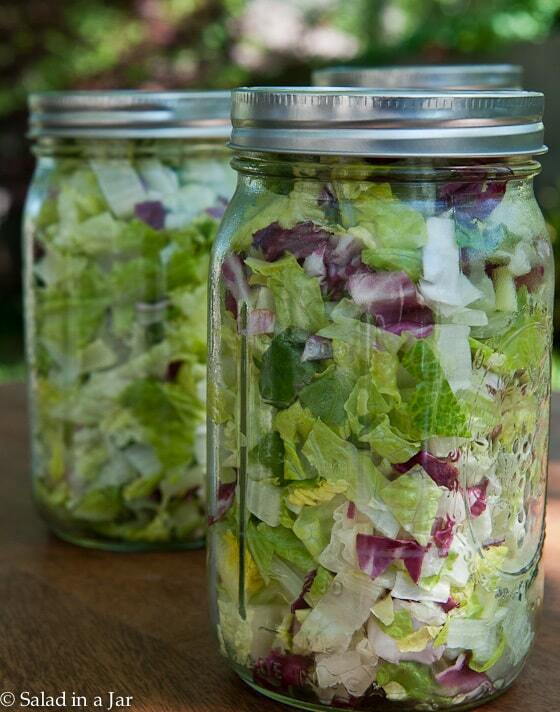 Because I keep the salad simple, I am able to assemble the jars in 10-15 minutes making the habit sustainable. I mention this because many readers have tried this technique but can’t resist adding other ingredients to their salad. While they are beautiful to look at and seem more interesting initially, they require more time to assemble, and storage time is reduced if the salad-filled jar is actually vacuum-packed. Certain veggies are too delicate for the process, e.g. spinach, tomatoes, mushrooms, and cucumbers. I’ve heard reports of people spending an hour or two creating a week’s worth of these fancy salads. Understandably, few people have the time and/or motivation to keep that up for long. Do I ever get tired of eating lettuce for lunch every day? The honest answer is yes, sometimes. Of course, I vary what I add to my salad, but occasionally, I skip it altogether for 2 or 3 days to give me a break before I jump back onto the salad wagon. In case you are new to this blog, you can read all the details here about how to make salad-in-a-jar my way or watch the video to get you started. Confidential to those of you who bought all the jars and vacuum-packing paraphernalia but decided it didn’t work for your lifestyle and/or preferences: Consider vacuum-packing nuts, flour, granola, small crackers, bread crumbs, dried fruit, pasta, and rice into all those jars. It’s easier to see what you have and keeps the bugs out. Besides that, it makes your pantry look all cool and organized. Which Machine Should I Buy to Vacuum-Pack Lettuce Into a Jar? Can I Add Other Foods to My Vacuum-Packed Jars of Lettuce? Previous Post: « Can I Use Whey Left Over From Straining Yogurt to Make More Yogurt? Hmmm. I don’t think adding more ingredients to the jar is about creating “fancy salads” that are “beautiful to look at”. It’s about having a meal with some nutritional value. Romaine lettuce definitely wouldn’t be a doctor’s recommendation of a healthy lunch. In fact, there is a nutritionfacts video that calls romaine lettuce the “Wonder bread” of vegetables. Nice to hear from you. I’m wondering if you have iceberg lettuce mixed up with Romaine. I would love to have a link to the video you are talking about. I’ve been doing this for a couple months.. I wash my lettuce with cold water cut it up just like you. And get water at the bottom after spinning.. but the lettuce never seems to dry enough.. usually after about 10 days the lettuce starts going bad and wilting.. If your lettuce is staying fresh for 10 days, that is all you can expect. I’m assuming we’re talking about chopped romaine lettuce that has been vacuum-packed, right? I absolutely love your blog! I am so glad I found it and that you post new and varied reciepes (your bread machine breads my favorite!). I also love that you still make your salads in a jar, and I can’t wait to get that routine going in my own home. Thank you for keeping this up and sharing with us :). I picked up some little storage cups for dressing, and I find that I can seal them right in the top of the salad jar – so now I don’t even have to decide what dressing I’ll have today! Oh yes, first thing in the morning, even trying to decide whether I want honey dijon or vinaigrette can be too much some days! I don’t know how else to say it, other than THANK YOU for sharing this so simple idea. It’s truly been a game-changer for me. Congratulations on 5 years! This is my favorite blog on vacuum sealing! I love your ideas, pictures, recipes, and your willingness to share. Truly, I have learned so much here! Thank you for all you do! Thanks Vicki. It has been fun! I’ve also learned a lot. So glad I learned about vacuum-packing from your blog. I never did pack salads in a jar, but use my Foodsaver for just about everything else. Thanks! Bonnie, I bet you probably pack some things I never even thought about. Hardly a day goes by I don’t vacuum-pack something. Congrats!!! Need to do my weekly yogurt, and I do thank you for that as well as all the other awesome recipes of which I use regularly! Thank you. You got me started. First came the hand held unit & jars with the lid attachments. Then bags. Now I love my big Food Saver vac and make double sized meals & freeze half in vac-sealed bags, which is so perfect right now. 6 days ago I had reconstructive hand surgery, but my hubby doesn’t cook without supervision of every step. Even he can manage warm-ups of my frozen dinners! I also dehydrate to store in vac bags and jars. You changed my life for the better, & I want to thank you for showing me how to begin. I am truly grateful or I wouldn’t be typing this left handed on a tablet with a stylus! I will spend the next 6 months to a year in this manner, so learning this was critical. Thank you forever! Get well soon. And thanks for the kind words. So fun to hear has vacuum-packing has improved your life. Congratulations on 5 years! I love your salad–in-a-jar process. You bring up a good point about making it more complicated by adding other ingredients, it does become a chore. I realize now, that that’s what happened in our household, so I haven’t used it in a while. I need to get back to basics.